Teams from Algeria to Zimbabwe converge on the GMEX centre for the Table Tennis championships. 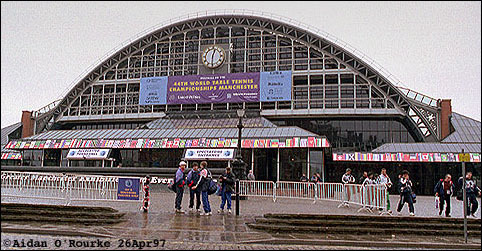 Sport has brought people from many countries into the hotels, streets, and stadiums of Manchester this week. On Wednesday, crowds of supporters dressed in black and dayglow green travelled over from Germany for the match between United and Borussia Dortmund. 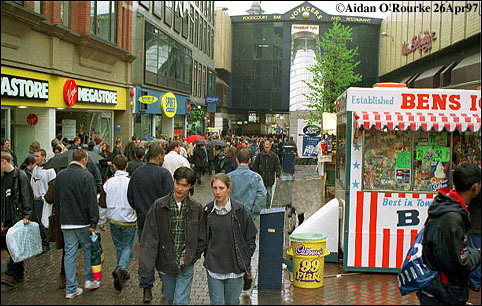 An open-air party was laid on for them in Albert Square, with food and drink, music and other entertainments provided. The fans were well-behaved, and there were only a few arrests. Manchester spirits were dampened however when Borussia went on to beat United 1-0, winning 2-0 on aggregate. Boddingtons, the famous beer makers, had to cancel a £40,000 advertising campaign congratulating United on their win, and on the buses later that evening, there were plenty of drunks offering incoherent advice for Alex Ferguson. On Thursday the 44th International Table Tennis Championships commenced at GMEX, where teams from many different countries, one for each of the flags on the outside, could be seen entering and leaving the Centre. Some were evidently finding the cold and rainy weather a little hard to cope with, as they pulled up their hoods and hurriedback to their hotels. The team from Ghana, caught in a wet gust of Mancunian weather, still managed a smile. The championships continue until the May Day bank holiday. Coverage and more info at the 44th International Table Tennis Championship Website. Senior party figures have paid more impromptu flying visits to the area. On Monday Tony Blair gave a speech to diplomats and senior business people in Manchester, and also went to Bury and Cheshire. Home Secretary Michael Howard was in Warrington and Manchester on Thursday, and Paddy Ashdown stopped off from his record-breaking nationwide trek to visit the marginal constituency of Hazel Grove on Friday. Tony Blair was back in Manchester this afternoon, accompanied by Richard Branson, travelling in one of the refurbished Virgin trains. Manchester's Co-op society, which runs supermarkets, an insurance company, a bank and other enterprises, is famous for its ethical principles and ideals of shared ownership. These ideals appeared to be threatened in recent weeks by a hostile 1.15bn take-over bid by the firm of Galileo, run by 31 year old entrepreneur Andrew Regan. Only after it was proved that Regan had indulged in malpractice, including circulating confidential Co-op documents to institutions in the City of London, did he drop the bid. The Co-op will pursue further legal action against Regan in the coming weeks, ensuring one of Manchester's prime institutions won't be split up. A horrific murder took place in the normally peaceful suburb of Bramhall around 11 o'clock last night, when a woman was found dead outside the Victoria Tavern. The 27 year old was found with her throat cut. People in the pub were interviewed by the police, who have set up a murder enquiry. Unsavoury elements, some with mental problems have been causing difficulties, I hear, at the Runway 2 protest camps. The city centre too seems to be a magnet for people on the margins of society, including many who sit on the pavement all day every day, either with or without a dog, and ask for money. At every street corner you hear the words "Big Issue mate? Big Issue madam? ", as homeless vendors of this fundraising magazine to help the homeless, try to get you to buy a copy. A walk along Market Street on a Saturday afternoon can be like an obstacle course, with screaming Socialist Worker activists near Boots, Hare Krishna converts opposite Virgin, Islamic fundamentalists near McDonalds, as well as, occasionally, Scientologists, Born Again Christians, Animal Rights Activists and others, all vying for your attention. Just after taking the photo above, I was sworn at by a tramp, who objected to me taking the photo with him in it, and muttered something about "graven images". In the end I gave a donation to a sane-looking older gentleman in front of Littlewoods collecting for Mental Health. The weather has turned drizzly, bringing welcome rain for the reservoirs, but making umbrellas and rain jackets advisable. More rain is forecast. Nighttime temperatures around 10/50.